Powers/Abilities: Empowered by demonic forces the Highwayman had no need for air, food, drink, sleep or other human needs and weaknesses. He possessed enhanced human strength and a powerful healing factor, regrowing flesh, shattered bones and inner organs at will. He could grow fingers from his neck for transportation in case his head had been severed from his body. He could reattach his head upon reaching his body. The demonic Blackrig, Bessie, was a living being itself and possessed healing powers as well. It could vertically ride up or down sheer surfaces, fly, and travel at several hundred mph. Bessie's trailer housed demons to whom the Highwayman fed the heads of his victims. The demons presumably powered the Blackrig. The Highwayman formerly had access to a large amount of advanced technology, derived from the Aliens. His truck, the Blackrig would respond to his mental commands and could fly through the air, or even in space. It could form a high-energy electro-force field to deflect attacks. Its tires were composed of a durable material which made them virtually immune to puncture. He gave Mary McGrill the whip, which, as Midnight, both allowed him to control her and allowed her to control others. He designed the whip so that he himself would be immune to its effects. History: (US1#1 (fb)/6 (fb)/11(fb)) - Jefferson was the older of two sons of a pair of truck drivers. His younger brother, Ulysses Solomon (US), idolized Jefferson and thought he let him win in contests to make him feel better. However, Jefferson was too humiliated to admit that his baby brother could beat him at everything. Even in school, Jefferson had to work like crazy to get passing grades, while US was a top student with minimal effort. When their parents were killed in a wreck, Jefferson took a job as a truck driver, so that US, could go to college (and then drive a truck). Jefferson resented having to give up his dreams, and this resentment turned into hatred. (US1#11(fb) - BTS) - A group of aliens came to Earth, seeking to recruit people to become starship pilots. They chose truckers, because of their experience with the solitude of the open road, much like that of space. Led by Al, they attempted to recruit the prodigy US, but (since all humans look alike to them), recuited Jefferson instead. They outfitted his truck with advanced technology and trained him in its use. Jefferson worried that the Aliens were not satisfied with his performance, and was afraid that they would eventually realize their mistake. He decided to keep some distance between he and his brother, to prevent them from discovering the truth. To this end, he decided to try to convince US he was dead. He established the identity of the Highwayman, and named his truck the Blackrig. (US1#1(fb)/11(fb)) - After college, US shared a truck ride with Jefferson, but they were suddenly run off the road by the Blackrig (actually the Blackrig was under Jefferson's control, with a mannequin/dummy in the driver's seat). The truck went over a cliff and crashed--US was badly injured, but maintained consciousness long enough to see the Highwayman and a band of apparent demons mocking him from atop the cliff. Jefferson's body was never found, but he was believed by most to have died. The demons were, in fact, Federation agents for the Aliens, who had finally begun to suspect their mistake and sent the agents to contact US. The agents took US to a hospital, where they saved his life. Nontheless, the Aliens were reluctant to throw away all of their years of training. Jefferson persuaded them to let him prove that he was US's superior. The Aliens granted US his "CB" Skull to allow him to compete more evenly with Jefferson's advanced technology. (US1#1) - Months later, US, believing Jefferson to be a prisoner of the Highwayman, went back out on the road in search of the man who stole his brother. The Highwayman, in the Blackrig, ambushed US, trying to push he and his new, suped-out truck, US1, off the road. US instead managed to drive the Blackrig over the edge of a cliff, but it never hit bottom, and no wreckage was found. BTS - The Highwayman used a hypno-whip to turn Mary McGrill, waitress for the Short Stop, into Midnight. (US1#2-BTS) - He sent Midnight attack US1, but he managed to fight her off. 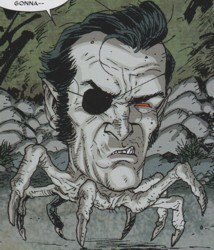 (US1#3) - Posing as an elderly trucker, the Highwayman related a tale of the demonic origins of the Highwayman. The man took off suddenly and US followed him, but was attacked by laser shooting trucks and bomb-dropping blimps--all agents of the Highwayman. US managed to evade the attacks and continued after the old man, thinking him a victim of the attacks as well. When US finally caught up to him, the old man allowed his disguise to slip off, revealing him to be the Highwayman, before escaping in the Blackrig. (US1#4) - The Highwayman sent Baron von Blimp to challenge US1 to a race, hoping to disgrace him, but US defeated von Blimp despite his cheating (and bomb dropping). (US1#5 - BTS) - Al the Alien arranged a confrontation with US and confrimed his supicions regarding US. (US1#6 - BTS) - Midnight took control of Wide Load Annie. (US1#7) - Midnight took control of the others at the Short Stop, and then challenged US to a race to redeem her earlier defeat. US again defeated her, and freed the others from her control. The Highwayman tapped into US1's computers, learning the secrets of its weapons systems, etc. He then developed countermeasures for these weapons for his own Blackrig. (US1#8) - The Highwayman watched as Taryn O' Connel was briefly framed as Midnight, and he planned for his final confrontation with US. Unbeknownst by the Highwayman, he, in turn, was observed by the Aliens. 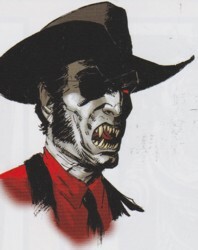 (US1#9) - The Highwayman watched as Midnight was revealed to be Mary McGrill, and as Baron von Blimp sought to double his income by taking money from others to ruin the Short Stop--what he had already been commissioned to do by the Highwayman. Jefferson then took to the road again, deciding to finish things himself, since none of his agents were being successful. He traveled to the Short Stop and confronted the whole group. (US1#10) - The Highwayman challenged US to vie for supremacy of the highways (and all that entails). The Aliens decided that things had gone far enough, and tried to take matters into their own tentacles. Jefferson fled in the Blackrig, drawing US after him. After proving he could resist any of US1's attacks, he stopped the Blackrig and revealed his identity. (US1#11) - Jefferson began to explain himself, but when he saw that the Aliens had followed, he flew into a desparate rage and attacked US, trying to strange him. The Aliens subdued him and brought both Archers and their rigs back to the shortstop. They explained their goals, and their mistaking Jefferson for US, and Jefferson explained to US how he did really hate him, and that it wasn't just the Aliens manipulating him. The Aliens then arranged a final conquest between US and Jefferson. (US1#12) - The Aliens altered the two vehicles, the Blackrig and US1, and sent the two brothers off in a race around the world. The race started on the road, took to the air, and ended up in space. US1 took to spaceflight better than Jefferson and took the lead. Furious, and refusing to lose again, Jefferson attempted to ram US, and kill them both. However, US managed to dodge, and Jefferson panicked and crashed the Blackrig into the Moon. The Aliens transported Jefferson to safety before the crash. US was chosen as victor, but Jefferson's fate was not revealed. (Ghost Rider VI#34 (fb) - BTS) - Inspired by his own fake origin Jefferson contacted "Satan" and was transformed into a more demonic state. "Satan" gave him the demonic Blackrig filled with demons, which Jefferson used to kill countless people and collect their souls for "Satan". Their heads he fed to the demons housed within the Blackrig's trailer. (Dark Reign Files) - Quasimodo researched the Highwayman for Norman Osborn. (Ghost Rider VI#33 - BTS) - Deacon and Blackout considered him as a possible agent in their fight against Ghost Rider (Blaze). (Ghost Rider VI#34) - Highwayman slew truck driver Big Ed, whose fuel delivery truck Highwayman directed into a nearby diner, The Laughin' Armadillo, blowing it up along with everybody within it...collecting more souls for "Satan". Back on the road Highwayman rammed the Alien Abductee Express, a bus filled with alien abduction enthusiats. He took all their heads as food for the demons in his trailer and their souls for his master. Unfortunately this incident attracted Ghost Rider (Dan Ketch), who nearly took off Highwayman's head with a sickle. Highwayman drove up a cliff with the Blackrig and ran over the surprised Ghost Rider. When Ghost Rider pieced himself together again Highwayman put in some music to run him over again, but Ghost Rider instead cut through the Blackrig's side with his sickle. Highwayman followed Ghost Rider up a mountain and rammed him again. While Ghost Rider was stuck on the truck's grill he flung his chain sickle through the front window and ripped off Highwayman's head. The Blackrig crashed and Highwayman's head attempted to return to his body, but Ghost Rider lighted it up and torched the Blackrig. Due to his powers Highwayman survived and healed up again. He stole a truck at Friedrich's Truck Oasis from an unsuspecting truck driver. (Deadpool Team-Up#896 (fb) - BTS) - Shortly after Jefferson founded the Highwayman Trucking Corporation. Highwayman to smuggle souls from Beelzebub's portion of Hell for his unidentified employer (possibly the "Satan", who had empowered him). (Deadpool Team-Up#896 - BTS) - ...it was a trap! Jefferson sent a gang of mutated raccoons after Ulysses and Deadpool to steal his own cargo so he could collect the insurance and then resell the cargo. (Deadpool Team-Up#896) - After Ulysses and Deadpool took out the raccoons and Deadpool accidentally blew up the cargo, Ulysses and Deadpool returned to Highwayman Trucking Corporation to confront Jefferson, who admitted to his attempt at insurance fraud and killing his brother. After a few hard words from Ulysses Jefferson offered him the soul smuggling job out of Beelzebub's portion of Hell. Ulysses took the job and Jefferson even gave him special chains for his tires and after Ulysses demanded it, workman's comp, because after all Ulysses was his brother. Comments: Al Milgrom and Herb Trimpe. I'll tell you what. This series was pretty goofy, but it is definitely a fun read. I bet you could find the whole series for a few bucks if you know where to look. He started out back back in the early days of trucking, a strong young buck, he could drive long and hard with the best of 'em. However, as he grew older, younger men in better rigs began to overtake him. Unable to accept this, he went looking for supernatural ways to fight off the ravages of time. He was refused by both the Ancient One and the Aged Genghis (What's that? 'Youth' you say? Do I look like one who knows the secret of eternal youth?). He persisted in his search until he found a coven whose master (presumably Mephisto, in the shadows) could grant him youth and power, at a price--his soul. Now he travels the road at night, hunting for souls to send his evil master. This information would most likely be a ploy to further confuse US. But part of it was apparently true. The Ancient One and Genghis refused his aid. The rest was just to perpetuate his legend as the scourge of truckers. We didn't know who the "Satan" was that mutated Jefferson or who the Beelzebub was he was going to steal souls from until it was revealed in Wolverine, Punisher & Ghost Rider: Official Index to the Marvel Universe#6 to be Lucifer. The names of Highwayman's parents were revealed in Highwayman's own profile in Official Handbook of the Marvel Universe A to Z Update#1 (April, 2010). Kudos to Jason Aaron for bringing back the Highwayman, and for making his initially (partially) false origin come true. Profile by Snood. Ghost Rider & Deadpool Team-Up update by Markus Raymond.